George Graham Reviews The Guggenheim Grotto's "Happy the Man"
The revival of Celtic music in recent years has provided the inspiration for many Irish performers and bands, but there is more to the Irish music scene than Celtic on the one hand, and the bombastic rock of U2 on the other. This week, we have a very appealing sophomore release by a group whose stock in trade is finely crafted melodic pop with a strong acoustic undercurrent. 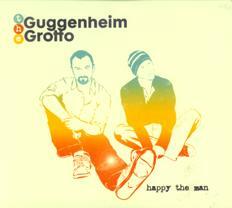 The call themselves the Guggenheim Grotto, and their new CD is called Happy the Man. Mick Lynch and Kevin May started performing and recording together in the early 2000s, and by 2005 had released their debut recording called Waltzing Alone, which was a hit in the band's home country, and also began to attract attention on this side of the Atlantic. They combined intelligent lyrics with pleasing vocal harmonies, and drew on influences going as far back as the Beatles for their tuneful songs. Along the way, multi-instrumentalist Shane Power became involved with the band's recording and production, and by this second release has become the third member of the group. For this second album, the Guggenheim Grotto added some light electronic sampling and more keyboards, but the sound maintains its acoustic textures. In fact, the group has ended up being categorized, for retail purposes, as folk, which I think they will probably acknowledge they are not. But their music does maintain the literate, often introspective quality of singer-songwriters. And sometimes there is an interesting contrast between the sunny-sounding music with occasionally downcast lyrics. The combination of sounds on their CD is an interesting and clever one, mixing some vintage keyboard sounds with occasional samples together with things like mandolin and cello, plus prominent acoustic guitar and piano. Their vocals and harmonies are given a clean sonic treatment, which they can get away with with their disciplined approach and excellent pitch. Their influences run from the Beatles to Leonard Cohen to blues to the Smiths. As on their first album, the Guggenheim Grotto starts with the more upbeat tunes and slows down as the CD goes along, ending with the more contemplative material. There are a couple of guest musicians, such as backing vocalists, and the cellist and a pianist. Happy the Man the new CD by the Irish group the Guggenheim Grotto, and not to be confused with the excellent 1970s progressive rock band called Happy the Man, is a first rate collection of intelligent, literate, melodic pop with influences running from the Beatles to contemporary sounds. Mick Lynch, Kevin May and Shane Power sounded as if they worked intensively in the studio, layering their parts in the finest obsessive popster tradition, going back to Brian Wilson or the Beatles. Their work paid off handsomely in a CD on which practically every track has something interesting and worthwhile to offer. It's a relative short album, at about 38 and a half minutes, but that's a good length for the kind of compact songs that the band serves up, and helps to keep the CD free from what could be considered filler material. Our grade for sound quality is a rare "A." There are some studio tricks and sonic artifacts in the recording, but it's tastefully done, and maintains good sonic clarity. The CD also has surprisingly good dynamic range for something in this style, allowing the music to ebb and flow from soft to loud, and giving good impact to the drums especially. Ireland is not usually thought as a land of melodic pop, but the Guggenheim Grotto defy the stereotype and create a thorough enjoyable multi-layered album that should be appealing to two or more generations of fans, from Baby Boomers to Generation Y fans of "emo."